This line is in the opening scene that launches the action of both Way of the Serpent and Shadow of the Hare. It’s advice that I hope readers of my books take to heart and, to that end, I’ve included lists of questions at the conclusion of both books. One of the things I’ve been hoping for is that one of my books might become a “book group” selection—and that has now happened! A group of professors at Lamar University read my book and then Skyped me in for a discussion last week. It was a thoroughly delightful interchange. I learned that Way of the Serpent caused them to think more deeply about the whole question of memories, their imperfection, the importance of how we share them with others, how we invest them in the objects with which we surround ourselves. I learned that they found it reassuring to see quality human relationships surviving all the gadgets and conveniences of my hypothesized future. I learned that they found the story’s ending (over which I agonized so much in the writing) to be poignant and appropriate. They liked the excitement of the story itself as it unfolded. They also liked the artificial trees with miniaturized 3D printers producing leaves in appropriate seasonal colors! If you like asking questions, contemplating answers, I hope you’ll come to my next public reading – June 9 at Malvern Books – where we’ll have the opportunity for a Q&A session! Here are the questions I came up with for my books. I’m sure you’ll have more! I don’t choose the titles of my books lightly. Way of the Serpent dealt with an old New Guinea folk tale about a contest at the beginning of time for human destiny, a contest between a bird and a snake to see whether human beings would be like snakes, shedding their skins and living forever, or like birds that have to die. Shadow of the Hare takes on the question of our human tendency to project our own wishes and desires onto the objects and experiences of our world. What do we see on the face of the moon—a human face? A hare? It depends. 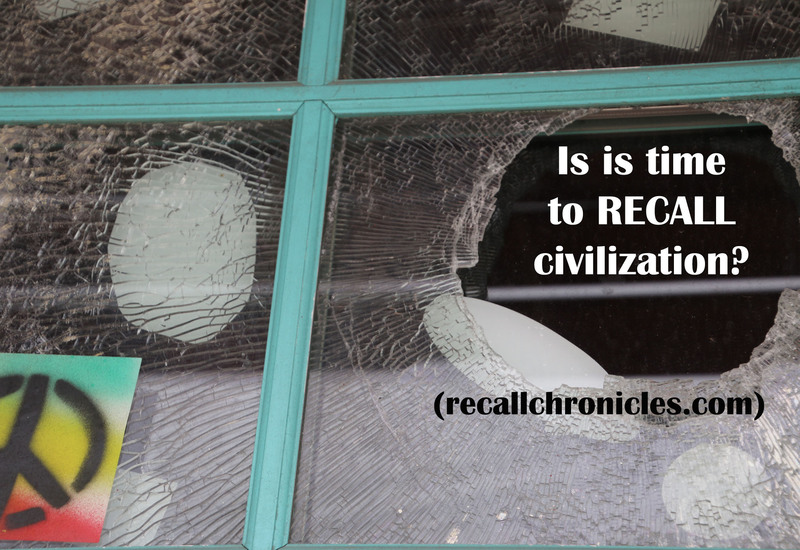 My highest aspiration is to write books that readers will want to go back to—to think about, to read again. I want to raise questions in the reader’s mind that will lead somewhere, not offering easy answers to life’s tough questions, but offering, perhaps, a sip of wine to aid digestion. Here’s to your enjoyment of my next book—cheers! Book launch event Saturday, May 21, 1 to 4 pm at Half Price Books on North Lamar, Austin, TX. Read the first chapters of Way of the Serpent HERE. Whether you celebrate Beltane or May Day or nothing at all, it’s good to take note of the first day of May, as it brings us ever closer to summer. It’s no wonder the day was traditionally noted by our agricultural antecedents in Europe as a time for the celebration of warmth and fruitfulness, fire and fertility! I find this particular May Day exhilarating, as it marks the beginning of the month I’ve selected for release of my next novel, Shadow of the Hare. This particular celebration is set for May 21, the day of the full moon that is known is some quarters as “The Hare Moon”. Associations of hares (sometimes rabbits) with the moon abound in folklore and I’ve always felt a personal resonance with the creatures. The symbolism has worked its way into my novel. Here’s a small taste–it was hard to find one without spoilers! I remember the year 2053, the year of the Global Peace Accord that officially put an end to war. Lio and I had gone to watch the celebratory fireworks displays on the D. C. mall, sitting in the shadow of one of the big war memorials next to a shallow pool. We lingered, watching the full moon rise, long after the crowd dispersed. “How do you think they finally got the big weapons manufacturers and military corporations to sign on to the accord?” I asked. I snuggled up closer to Lio as a breeze rose up, rippling the water on the pond where the full moon was reflected. “Of course, weapons aren’t just guns and bombs these days,” I mused. “Did you ever see a man in the moon when you were a kid?” Lio asked. “Can you still see a face on the moon?” I asked. 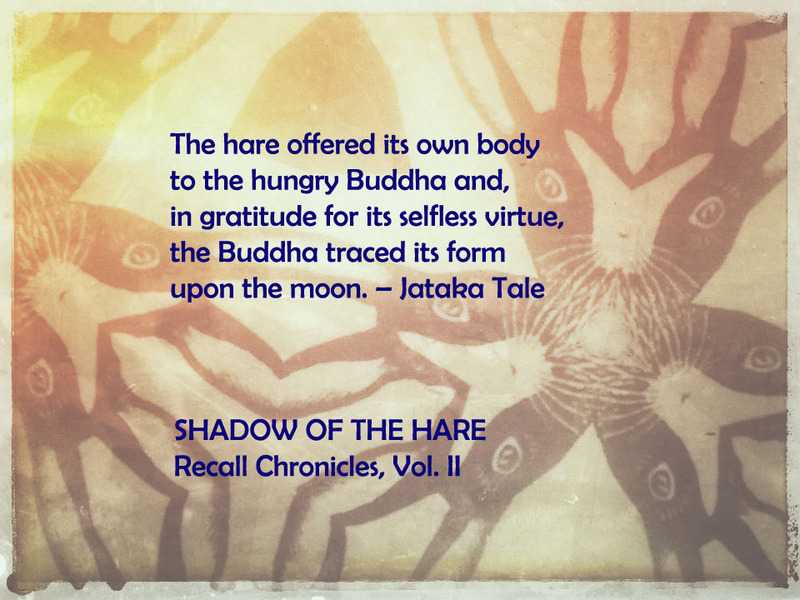 PRE-ORDER Shadow of the Hare on Kindle and receive it May 21st! 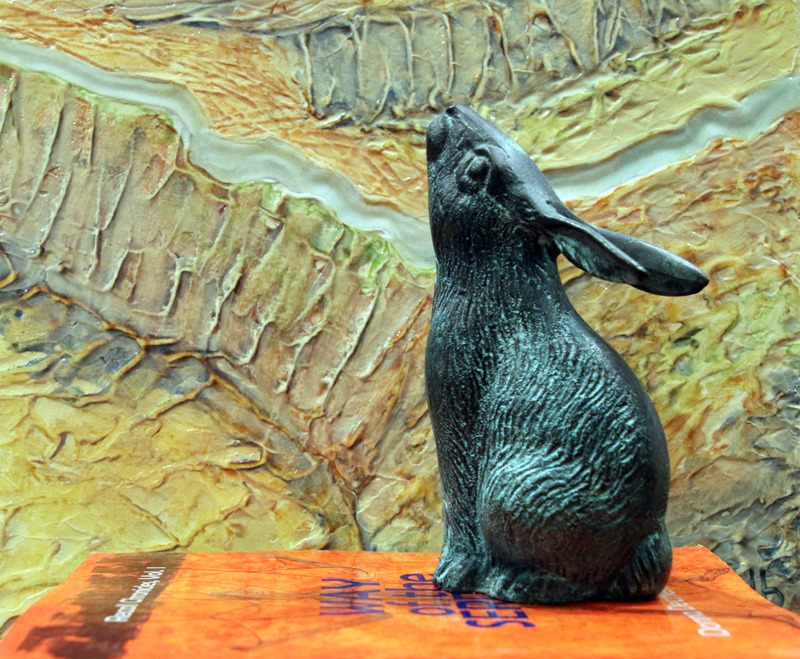 Celebrate release of Shadow of the Hare May 21st, 1 pm to 4 pm, at Half Price Books on North Lamar in Austin. Get your signed paperback copy and register for free gifts!